Screen Protector and Crystal Casing: Pretty cheap and should be one of the first things that you should purchase for your DS. Since scratching and/or permanently damaging your device is never a good thing. Pouch / Leather Case: The reason for purchasing one is pretty self explanatory. The problem with having a crystal case however is sometimes that will prevent you from purchasing a hard-cover type of pouch since most of them are made to cradle the exact dimension of the device w/o the extra bulk of the crystal case. Wrist strap: Not a necessity since some versions already comes in with one. If yours (like mine) didn't have one with the package ... purchasing one might be a good idea to avoid accidentally dropping the device while carrying it around or even while playing with it. Extendable stylus: I purchased one and although at first it may not sound like a big of a deal, having a slightly longer stylus makes prolonged gaming easier on your hands. 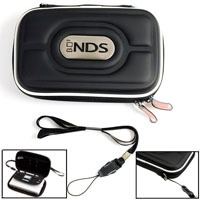 R4/M3: This should have been part of the NDS package in my opinion. Being able to take with you all of your games on a single Micro SD, being able to download 3rd party softwares like mp3 player, video player, photo editors/viewers, organizers, ebook viewers, etc is something that will make you more than twice as happy that you purchased the NDS. ***All the pics on this review are property of their respective owners. **What do you think about my Nintendo DS Lite review? Please sign my guestbook before leaving, it's the least you can do to thank me, and the only way for me to know that someone did visit my site! *Contact me if u have any comments and/or suggestions. Tnx!